The John O'Keefe Memorial Award is presented annually to an individual in the Huron-Perth organization who has provided outstanding volunteer work with Lakers teams and/or the Association. With the permission of the O’Keefe family, it was created to memorialize the late John O’Keefe by celebrating the type of contributions he made as a parent, trainer and manager. John approached his volunteer work with an open heart and an open mind - simply looking for ways to help. He was a strong believer in what the whole Lakers hockey experience provides for young players: the pursuit of excellence in a competitive environment. Lakers Vice-President Kevin Nicholson (left) presents the award to Jack Chaffe (right). "This year’s recipient joined the Huron Perth Lakers in 2006 and took an active role almost immediately. He started off by coaching the 97 team in their minor atom year and averaged almost 30 wins a year while collecting 118 wins over 4 years with this team. He didn’t just coach he was also very active within the organization as well. He served on the Coaches’ Selection Committee on two different occasions and spent hours driving around from rink to rink interviewing potential coaches. He also joined the executive in 2006 and was a member of the Hockey Operation Committee in 2007 serving as Head of Hockey Operations for 3 years. Our recipient helped form and mold many of our programs that we are still presently running. As a member of Hockey Ops he also took on other roles as needed he was equipment manager making sure we had supplies to start the year and as a coaching mentor working with many of our new coaches. He was also involved in the 2009-10 season to help in the bidding and hosting of the OHF’s in St. Marys. This recipient was always there whenever he was needed and made time for you….unless he was on the ice….a call made early in the day or late night was also answered. He never sought credit for his efforts he just went about his duties and tasks without bringing attention to himself. When he left the organization late in the 2011-12 season it took 3 executive members to cover off on the work that he was doing. It gives me great pleasure in introducing this year’s John O’Keefe award to Jack Chaffe. " Lakers President Kevin Nicholson (left) presents the award to Craig Metzger. "Craig Metzger joined the Laker organization and Executive shortly after his son Joe made the 1995 Minor Atom team in 2004. As a Laker Executive member, Craig immediately jumped into a heavy workload with important positions as Alliance Rep and Registrar. He volunteered as manager for the 1995 team and became statistician. His elaborate Excel spreadsheets are still used by some Laker teams as an important tool to keep track of team and individual statistics. During his tenure as an Executive member, Craig represented the Laker organization at numerous Alliance meetings and articulated Laker positions on topics such as Spring Tryouts, Residency and other important Alliance rules. Craig was instrumental in helping develop the Laker website. MB Sports in Goderich created the current Laker website and with Craig's assistance and suggestions for improvement, MB Sports continued to expand and improve it. There are numerous features within the website that are the direct result of Craig's recommendations and ideas. Currently, the MB Sports website is used by over 100 different organizations and is considered the pre-eminent website for minor sports organizations. Craig's contributions to the improvement and development of the Laker organization have been invaluable. Many aspects of the organization have changed over the past 8 years. Craig's involvement has been significant and noticeable. Areas that most Laker families take for granted such as branding, fundraising, written policies and procedures, Laker clothing, classified ads for equipment, all have Craig's fingerprints all over them. In the past few years, Craig's role on the Executive changed. He took on role of Website Administrator, always ensuring the Laker website was current and informative. Craig often encouraged teams to write articles about their teams and often was the editor of content. Craig has been the author of numerous organization articles. Many organizations look to the Laker website to copy ideas and format their own websites. Last year, Craig officially resigned from Laker Executive and became our website consultant. Even today, Craig is still considered an important resource and "go to" guy when a question comes up that no one else seems to have an answer for. It is also worth noting that during the past 8 years, Craig has been a tremendously dedicated and devoted hockey Dad. Joe has played 8 seasons for the Laker organization and played in approximately 500 games. Craig attended a majority of these games and travelled thousands of kilometres to support Joe in his Laker career and at the same time, balanced the hockey schedules of this two other sons. Craig, Kelly and family have been the ideal Laker family during all these years. Mackinley O'Keefe (left) and Lakers President Kevin Nicholson (centre) congratulate Hugo Maaskant as he's presented with the award. Lakers President Kevin Nicholson (left) and Mackinley O'Keefe (centre) as they present the award to Scott Pettigrew. Lakers President Hugo Maaskant with award recipient Julie McConnell as she accepts the award from Mackinley O'Keefe. 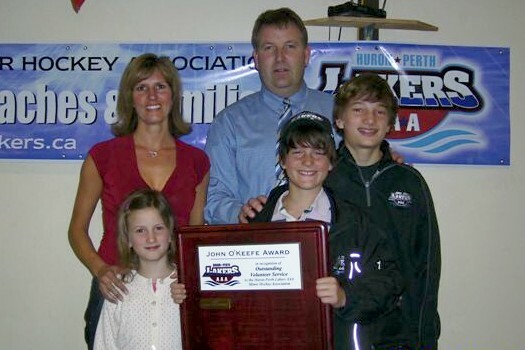 The O'Keefe family (Shelley with Kailey, Riley, and Mackinley) along with award winner, Dave Dykxhoorn.